“This girl does not deserve to die!” Haemon urges his father, Kreon, King of Thebes. His plea carries a special weight, because the girl is his fiancee, and the man he’s addressing is the man who plans to kill her–to bury her alive, to be exact. We are, of course, in Antigone territory, the Sophocles version of it–sort of. 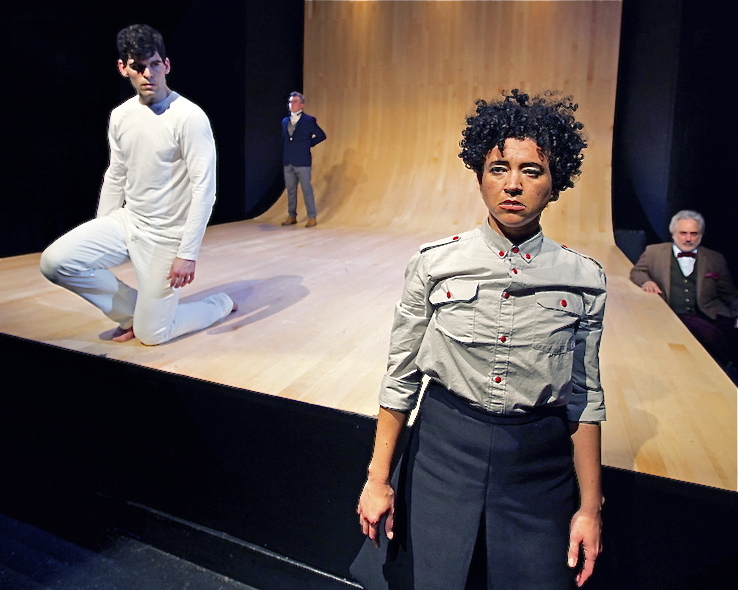 Now at Shotgun Players, it’s director Mark Jackson and choreographer Hope Mohr’s taut and sizzling staging of poet Anne Carson’s personal re-working of the play, so personal that you may not recognize the original even while this one, called Antigonick, lifts your eyebrows up to your hairline. One of Carson’s most effective alterations is the appearance of Kreon’s wife, Eurydike, in an eye-popping monologue, staged with a minicam that projects her face in anguished closeup. Kudos to Monique Jenkinson for bringing off the moment so startlingly well. The story, which takes place in the aftermath of Oedipus’s terrible unmasking as both son and husband to Jocasta, is well known. As the play begins, Oedipus’s brother, Kreon, has assumed, by right, the rule of Thebes. Antigone is Oedipus’s daughter. Her two brothers have slain one another in a recent war. Decreeing that one of them was a traitor, Kreon denies him burial. Defying her uncle, the outraged Antigone buries him, and the angry, righteous King condemns her to a horrible death. The story offers no suspense. What engages us is how it’s told, and Anne Carson tells it, and Mark Jackson and Hope Mohr stage her retelling, with an inventive strangeness. You’ve not seen anything quite like it before: mocking, elliptical, drummingly loud, eloquently silent, graceful and violent, remarkable in its expression of inner states through dance and motion, for example when Antigone and Kreon fling themselves repeatedly at an unclimbable wall. Directors Jackson and Mohr deserve much praise, as do their production team: Nina Ball who designed the stark, smoothly curved set, Stephanie Buchner who provides subtle lighting, Christine Crook who conceived the striking costumes, and Theodone J.H. Hulkser for his remarkable, pulsing sound design and Beth Wilmurt for vocal music. The production is fortunate in its Antigone, played by the fiercely present Rami Margron–she takes no prisoners. The rest of the cast matches her quality: David Sinaiko as the nattily dressed lawyer/chorus; Kevin Clarke as the rigid Kreon who discovers too late that justice trumps law; Parker Murphy as the eloquent silent dancer, Nick, who is both a witness to events and an expresser of them (his name has something to do with “the nick of time”); the excellent Kenny Toll as the doomed Haimon; and fine-tuned Monique Jenkinson as Antigone’s sister, Ismene. Irresistibly off-beat, Antigonick plays at the Ashby Stage until April 25th, followed by Marisela Treviňo Orta’s Heart Shaped Nebula. For tickets/information call 841-6500 or visit www.shotgunplayers.org.